Further propaganda from Memorial’s Faculty of Medicine? Once again I think there are questions to be asked about the openness and balance of statements from Memorial University of Newfoundland’s Faculty of Medicine. The Doctor of Medicine (MD) program at Memorial is jointly accredited by the Committee on Accreditation of Canadian Medical Schools (CACMS) and the United States-based Liaison Committee on Medical Education (LCME). (1) Was the announcement by the Faculty on June 19th 2015 open and balanced? (2) Have the accreditation agencies changed the date for their visit due to concerns about the quality of Memorial’s MD program particularly in the light of the allegations of bullying, intimidation, harassment and sexual harassment which are currently under investigation? (3) Should the announcement by the Faculty on June 11th 2018 have been more open and balanced? Following my post on June 28th 2018 about this subject, I noticed that the Faculty of Medicine have changed the news item about the next formal accreditation visit(1) from 2018 to 2021. Separately I have learnt that the associate dean for undergraduate medical education thinks the next formal accreditation visit will be in 2021. The change of date in the link could be in order to correct a typing error. 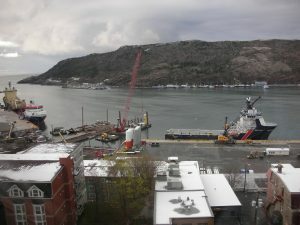 However, a former associate dean in community health and humanities in the Faculty of Medicine, who remains employed at MUN, and the dean of medicine have stated that the joint accreditors, the CACMS and the LCME, have decided the period between accreditation visits is too long and so they have introduced an interim accreditation visit. There is therefore dissonance between on the one side, the changed text in the news item and the understanding of the associate dean for undergraduate medical education, and on the other side, the understandings of the former associate dean in community health and humanities, and the dean of medicine. The issue might not appear to be important but it does reinforce the need to ask questions about the openness and balance of statements from Memorial’s Faculty of Medicine. Also, the question remains about whether the accreditation agencies have considered changing the date for their visit due to concerns about the quality of Memorial’s MD program in the light of the allegations of bullying, intimidation, harassment and sexual harassment in the Faculty of Medicine?